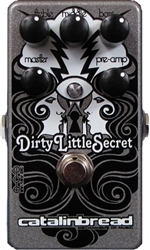 The Dirty Little Secret has earned itself a well-deserved reputation for replicating the sound and feel of a classic era Marshall amplifier, supplying one of the most iconic guitar sounds in music. 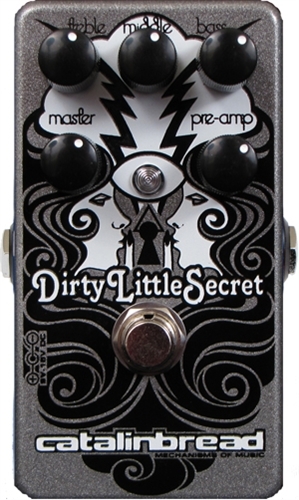 When the JFETs used as the base for the Dirty Little Secret were discontinued, and as our stock of them began to dwindle we knew we had to find ones still being manufactured. However, rather than simply re-voicing around these new JFETs, we decided to push the envelope and provide an amazingly robust feature-set, from ever evolving listening and circuit skills, and pure power of intention. This isn't just 'a' Marshall in a box, it's the most versatile and dynamic Marshall-style overdrive out there! Complete redesign with two Marshall modes. Super Lead and Super Bass to suit your sound. Fantastic cleanup with your guitar's volume control. Ideal for stacking with fuzzes, ODs, and boosts. Exact tonestack circuits from SL and SB amps for true-to-amp response.